Mid-week market update: For the last few weeks, I have been writing about a possible market stall ahead (see Peering into 2020 and beyond). So far, the pullback has yet to materialize, though risk levels continue to rise as the SPX approaches its resistance zone at 2800-2810. Here are some reasons why the market might be defying gravity. From a technical analysis viewpoint, the bull case can be summarized by healthy positive breadth, and strong price momentum, as evidenced by a breadth thrust. 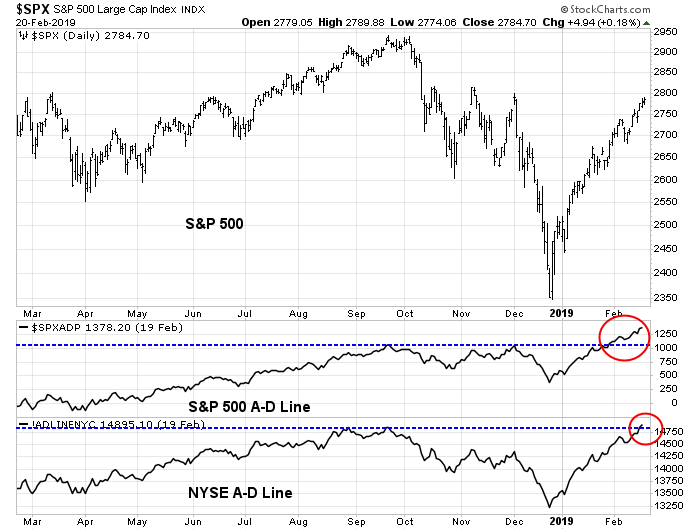 As the chart below shows, while the SPX has rebounded and it is below its all-time high, both the NYSE and SPX Advance-Decline Lines have made new all-time highs. This is generally interpreted as a bullish development. In addition, the % of stocks above their 50 day moving averages surged above 90% in this latest rally. 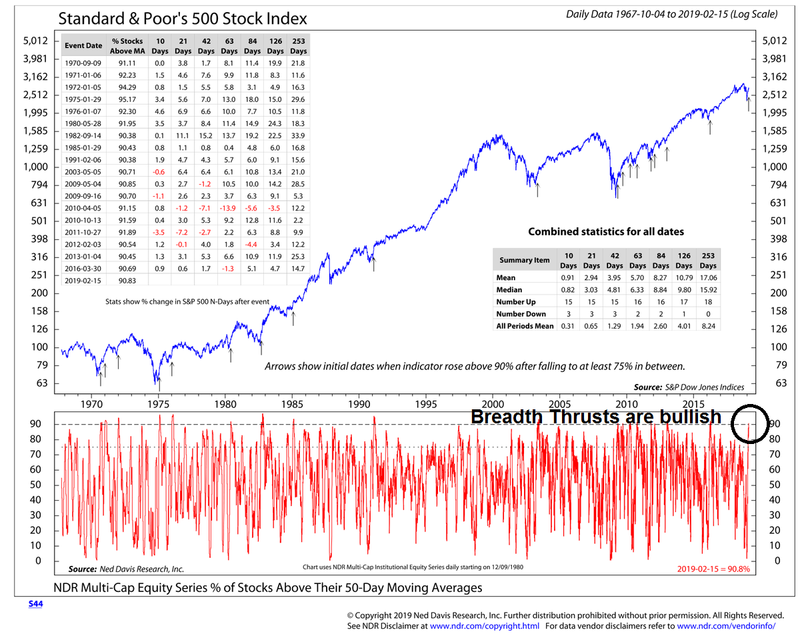 Such conditions are indicative of strong price momentum, otherwise known as breadth thrusts. Analysis from Ned David Research shows that past episodes have tended to resolve in a bullish fashion. 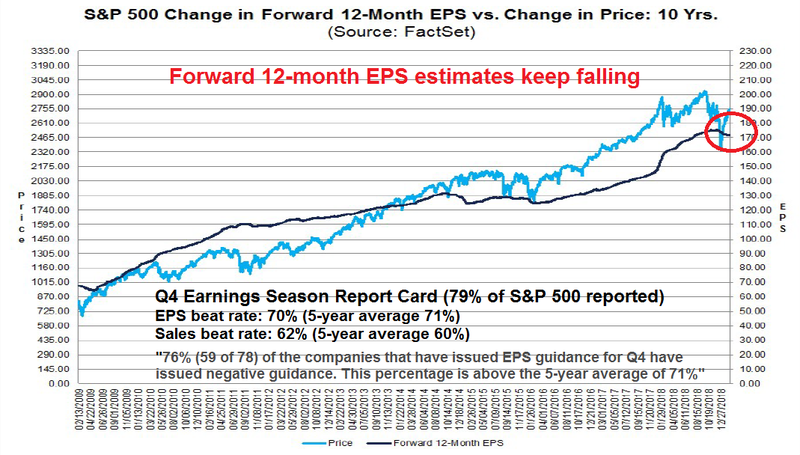 On the other hand, I have documented how consensus EPS estimates have been steadily falling for the last few weeks, and Q1 guidance has been worse than average, indicating a deterioration in fundamental momentum. Market internals have also been weakening. 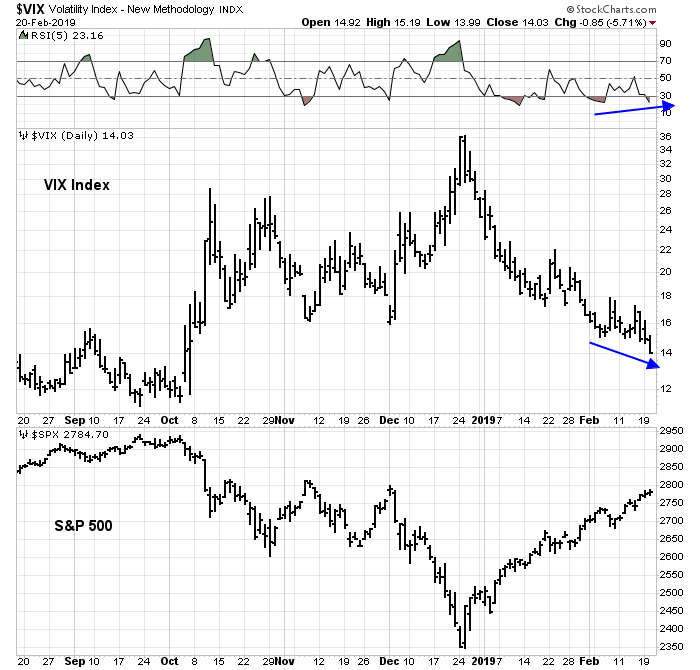 The VIX Index, which is inversely correlated with stock prices, continue to exhibit a positive RSI divergence. Should the VIX spike, stock prices are likely to fall. Subscribers received an email alert today that my inner trader took profits in his long positions and he is dipping his toe into the short side of the pool. 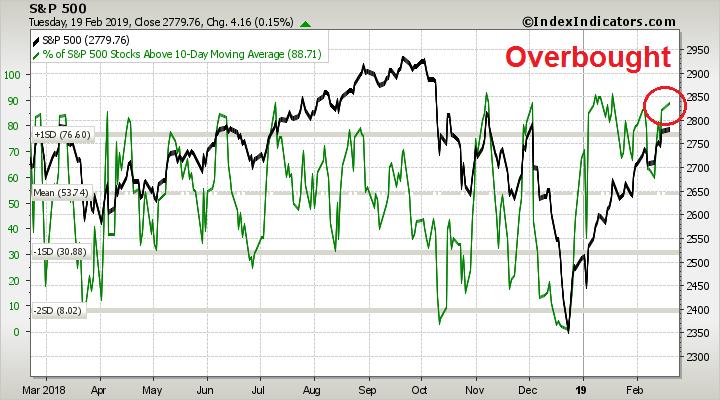 The Daily Sentiment Index (DSI) for stocks stands at 88, which is also an overbought condition. 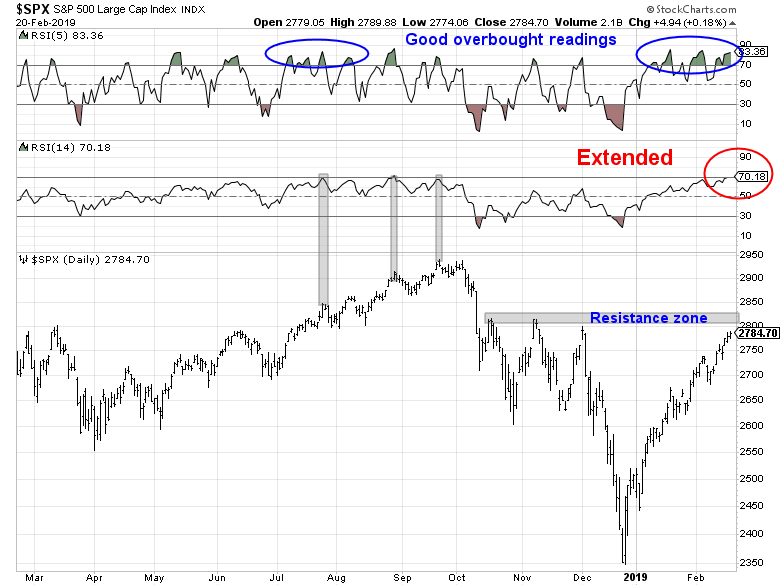 In addition, I had highlighted that while the market continued to grind upward on a series of “good overbought” conditions on RSI-5, it has stalled when RSI-14 reached 70, which is an overbought reading. 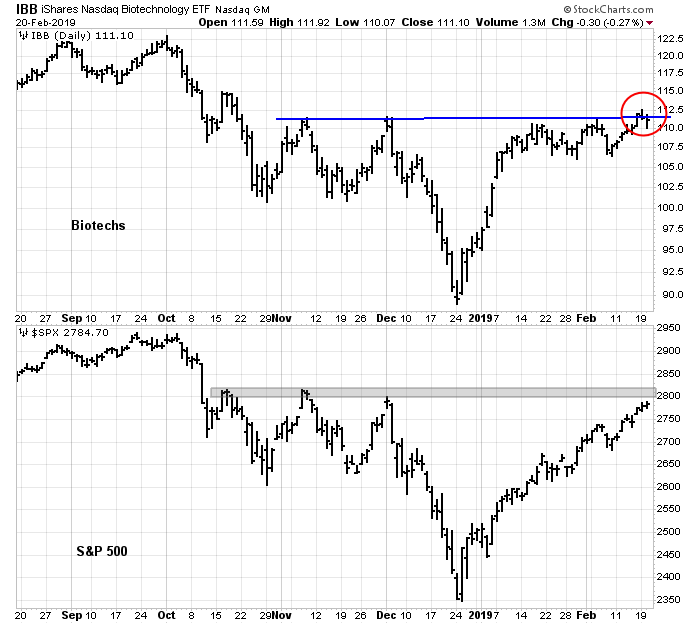 One of the key technical tests may be the behavior of the biotech stocks. Biotechs have already broken out to the upside, while the broad market averages haven’t yet. The question of whether this group can hold its breakout could be a key barometer to the short-term bull/bear outlook for this market. My inner trader has taken a small initial short position, though it is not a high conviction trade. The market is sufficiently extended that he is prepared to add to it should the market rise on the news of a trade deal, or truce.